The Jardin aux Moines - Monks' Garden is situated along the road D141 north of Tréhorenteuc in the Forêt de Brocéliande. Its northern side of this ancient burial chamber is delineated by 27 megaliths and its southern side by 26. 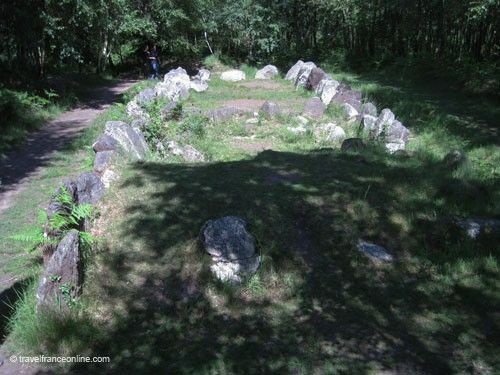 The 27m long tumulus or cairn consisted of two separate chambers. The eastern chamber is the oldest and dates from around 3000BC. The archaeologists who excavated the Jardin aux Moines in 1980 concluded that the burial monument had been re-used and enlarged. The rectangular western chamber was therefore added later, during the Bronze Age. 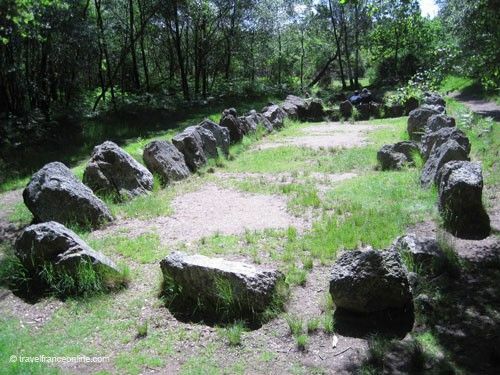 The megaliths were cut from quartz and local red schist. As a result, these stones produce an interesting variation of colours that evolve with the daylight. Excavations also uncovered two potteries dating from the late Neolithic period. Both laid under a heap of red and white stones. This use of various coloured stones was obviously intentional and therefore must have had some symbolic meaning. The Jardin aux Moines is quite impressive as most of these stones were left undisturbed over the centuries. It has therefore been part of the magical Forêt de Brocéliande for millennia. It's not surprising that it should have triggered the appearance of two legends. Long ago, St. Méen, one of the popular Breton saints, lived in the region. So did the debauched and unrepentant monks of a nearby convent. St. Méen couldn't tolerate such behaviour and therefore turned the monks into statues. The second legend tells the story of the lord of Tréhorenteuc and his men who went hunting on the Day of the Dead. They were punished too and turned into stones for not respecting this major religious celebration! The Jardin aux Moines is tuck away in the woodland, but it is well maintained. You therefore need the GPS coordinates to find it, but it's really worth the detour. Directions: From Tréhorenteux follow D141 towards Mauron, the site is located half a mile on the left side of the road at the first junction after Tréhorenteuc. 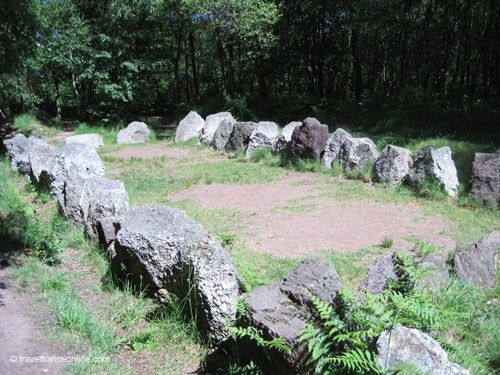 The megaliths are located 50m from the small car park and inside the woodland.